Animals have been around far longer than humans on this Earth. As such, they have a collective knowledge much deeper than we do. And it behooves any good shaman to go and seek advice from the animals and to gain wisdom from them. That's what you're doing in Bumuntu, a new board game coming from WizKids. In Bumúntú, each player becomes a tribal leader journeying through the Congolese jungle, following the guidance of the animals and earning their favor. Each turn, players will travel around a board of 64 randomly assigned Animal Tiles by utilizing the animals’ individual abilities, inspired by each animal’s unique traits. Zebras, for example, can run in straight lines, and Flamingos allow players to fly to other spaces. Some animals allow players to attack each other, such as the venomous Black Mamba and the charging Rhinoceros. The most valuable tiles will change throughout the game, as players rearrange the Animal Favor Board to try and maximize the amount of favor their tiles will earn. At the end of the game, players will score points based on the number and types of tiles they’ve collected. 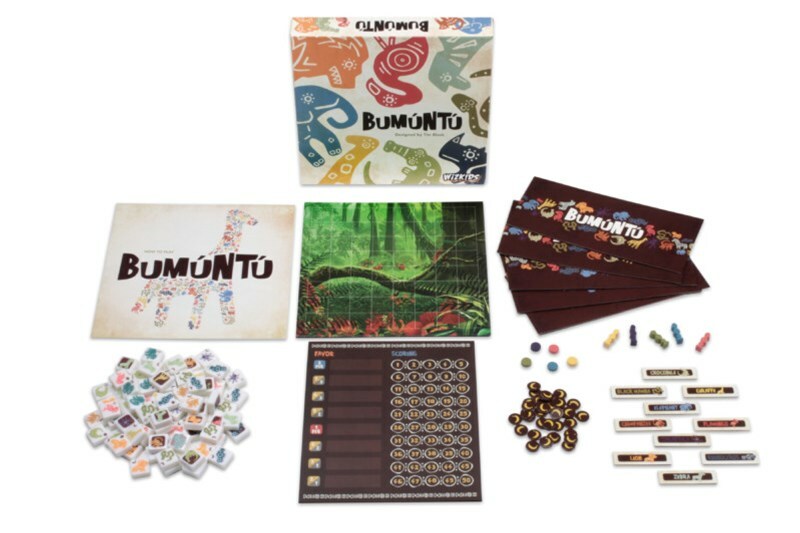 Bumúntú contains ten different animals, and players choose eight to play with each game, allowing for players to have a bit of control over the amount of interaction on the board, creating a more programmed game for more strategic players or a more interactive game for those who like to make (and break) alliances. Will the animals look kindly upon you, or will you get lost in the jungle? Find out in Bumúntú, available for pre-order at your Friendly Local Game Store or online today!